Louis the Clown and Mr. Dudley are back in an all-new adventure that will take you through the dark corners of history's most famous fairytales to rescue children trapped in a frightening netherworld! Louis is up to his old tricks as he casts each child in the role of a legendary fairytale character and then creates the visually stunning but twialay out. Use your skills and intellect to find hidden objects and solve puzzles as you make your way through the stories of Cinderella, Peter Pan, Aladdin and more! 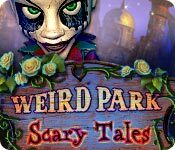 With its spellbinding story, extraordinary atmosphere and stunning cinematics, Weird Park: Scary Tales is an instant hidden object classic!